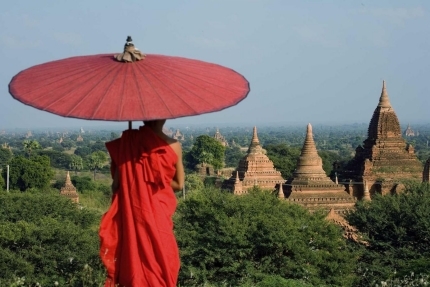 Burma, or Myanmar as it is now known, is the western gateway to Southeast Asia, straddling two of Asia’s great rivers and the mountainous foothills of the Himalayas. The diversity of its people, culture, and topography combined with a rich history, make it one of the region’s most fascinating and beautiful countries. On this journey we explore central Burma, travelling from the Irrawaddy River plain up to the Shan Plateau and all along we will be greeted by warm, friendly people few tourists get to meet. From the heights of Mt. Popa we will cycle down to the ancient city of Bagan and cycle amongst the pagodas, stupas, and temples dominating a river valley that once formed the centre of a great and deeply religious empire. A boat ride up the Irrawaddy will take us to ancient temples that we will reach by bicycle. We arrive at Kipling’s Mandalay and explore the surroundings before we head up to the Shan lands, home to a multitude of tribal people, and a fantastic contrast to lowland Burma. In the mountains we enjoy cooler weather and the colonial charm of Kalaw, where the officers of the Raj went to escape the summer heat. We then head down to the wondrous Inle Lake and embark on a relaxing full day boat trip where we can marvel at the Intha fishermen, who famously manage to row with their legs. A truly wonderful adventure!